3.6 x 2.9 x 2.5 cm. The Idarado mine is most famous for its manganoan calcite specimens. In fact, the largest quantity of the finest quality manganoan calcite specimens from Colorado were found in this mine. 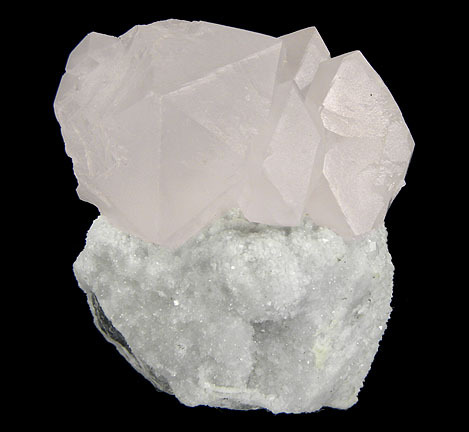 This specimen consists of superb quality, sharp, scalenohedral manganoan calcite crystals with a soft pink hue which are sitting atop white Quartz matrix. The largest crystal measures 2.1 cm across. The Calcites are translucent when backlit. The crystals are essentially pristine and very fine quality for this locality.